‘April in Paris, this is a feeling/ No one can ever reprise’ From Louis Armstrong to Frank Sinatra, many poets and singers have waxed eloquent about the joys of visiting Paris in April. Paris wakes up after a long slumber of snow and rain and emerges like the pink cherry blossom, fresh, pretty and pleasing to the eye! Paris in April is a lovely travel destination as you get to enjoy the visual beauty of Paris, great weather, and the tranquillity of Paris before the summer tourist hordes descend upon the city. From Eiffel Tower tours to cruises on the Seine, there is a lot to do in Paris in April. Why is Paris in April a must-visit? What makes Paris in April a must-visit? Balmy spring weather - The winter is finally gone and the pleasant spring sunshine graces Paris in April. Of course, there are the occasional rain showers but no one can resist the warm sunny days that make sightseeing and traveling a fantastic experience. 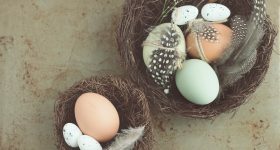 Explore like a local - Parisians are still in town in April and enjoy a lot of activities including the Easter festivals. This is the ideal time to experience Paris like a local before the summer crowds throng in to the city. Go on an Easter egg hunt with the kids or eat a meal al-fresco in a cafe. Enjoy the outdoors - Spring time means the blooming of the cherry and apple blossoms, and public gardens and parks taking on various hues of green. It is the perfect time to walk the length of Paris with no complaints at all! Affordable stay - April is just the beginning of the tourist season, so while the rates of hotels are not at the winter low, you can still grab good deals while enjoying the spring weather. Paris in April is in the throes of spring season and sees a comfortable weather through the month. The highest temperature recorded last year was 28°C and the lowest 10°C. You will experience warm sunny days but be prepared for the occasional thunderstorm as there are as many as 14 rainy days in April. Paris also experiences longer days and sun sets at 8:20 PM at the start of April and almost at 9:10 PM towards the end, giving you enough time for outdoor sightseeing. The lawns near the Eiffel Tower are sprouting in fresh hues of green, getting out their winter hibernation. Check the weather before you go and you will enjoy the first sunny days of the year and splendid clear views of the sprawling city. Around Easter, you may even spot a chocolate egg! 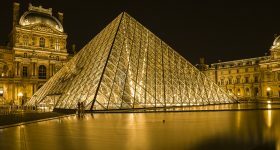 Louvre , the biggest museum in the world, warrants a visit any time of the year. The indoor museum holds over 38,000 artifacts and paintings. The museum is conducting a temporary exhibit ‘Archaeology Goes Graphic’ where archaeology meets comics and is on until July 1st 2019. 21st April 2019 is Easter Sunday and you can celebrate the day like Parsians with a mass at the centuries-old Notre Dame Cathedral . The cathedral, especially its facade, is a French-Gothic architectural wonder and you shouldn’t miss the rose windows. Go up the towers for a good view of the city. April is one of the best months of the year to visit the Palace of Versailles , the 17th Century Royal French Residence. The green trimmed lawns spring alive after the winter snow and the weather is also pleasant enough to stroll through the gardens without really breaking a sweat! A Seine Dinner Cruise is one of the most romantic things to do in Paris. The stretch along the Seine is a UNESCO World Heritage Site and has iconic landmarks including Notre Dame and Eiffel. 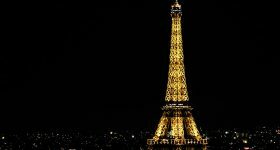 The 1.5 hours cruise includes a 3-course dinner with a glass of wine, a perfect day to a day in Paris. Get into the Christmas spirit by attending a soulful Christmas concert at Saint Chapelle. Marvel at the painted glass windows, gothic architecture and the beautiful Christmas decorations as you sit back and enjoy the performance. The Montparnasse Tower is a 210m high concrete behemoth in the centre of Paris. The skyscraper is used as an office building but its highlight is the observation deck which offers excellent views of the city including the Eiffel Tower. The clear night skies of April are ideal for photography. The abbey and the island of Mont St. Michel is one of the most impressive sights in France. The rising spires of the abbey and the settlement surrounded by water creates an enigmatic scene ; feels right out of a fairytale! The UNESCO World Heritage Site sees more than 3 million visitors each year. The Museums of L’Orangerie and D’Orsay holds the best collection of Impressionist and Post-Impressionist paintings of masters like Cezzane, Monet, Matisse, and Renoir. In April, the D’Orsay is conducting the ‘Serusier’s The Talisman’ exhibition and the L’Orangerie is hosting the ‘Counter Point2’ exhibition apart from the permanent collections. The rousing Can-Can dance and the glitz of the Cabaret make for unforgettable evenings in Paris. Enjoy a Cabaret dance performance in Paris , be it Moulin Rouge, Lido, Paradise Latin or Crazy Horse. Also, many of the theatres like Moulin Rouge and Paradi Latin bring out new routines in April so you're in for a fresh treat! The Paris Foire du Trone or the ‘Fair of the Throne’ is a 10th century tradition and still going strong. Family-friendly and affordable entertainment sets apart this traveling fair from other amusement parks in Paris. From street food stalls to thrilling rides like rollercoasters, the Fair has all the elements of a rustic yet modern entertainment avenue! Over 145 art galleries are coming together in the 21st edition of the Art Fair to showcase incredible post modern work of artists. One of the best venues to appreciate and buy art, this year’s edition focuses on women artists, and Latin American art. The exposition is held at the Grand Palais and makes art accessible to all spectrums of the society. The Color Run is an exciting 5KM run inspired by the Indian festival Holi. Participants throw organic colors and enjoy the colorful revelry on the streets of Paris. It generally happens bang in front of the Eiffel Tower, so enjoy a bit of Indian tradition right here in Paris. At the end of the run, all participants come together to throw colours, grouped with non-stop on-stage music by DJs. Easter in Paris is the best time to experience Paris like a local. From Easter egg hunts at the Eiffel Tower to Easter concerts at churches like Sainte Chapelle and Notre Dame Cathedral, Paris takes on a celebratory mood on Easter weekend. Restaurants run special Easter Brunches and Dinner while you can get the best baked goods and chocolates in stores. The Livres Rares & Objets D’Art is a bibliophile and antique connoisseur’s ultimate dream! 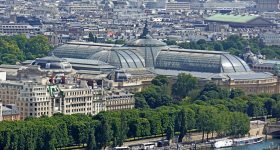 Over 150 international booksellers, libraries, and antique collectors display their collections at the Grand Palais. The collections include rare books, unique art objects, special autographed editions, first editions etc. The exhibition is conducted annually by the International League of Antiquarian Booksellers. April sees a lot of pleasant and warm days but with a chance of rain. The average day-time temperatures are about 11°C with the low of 10°C and a high of 28°C in mid-April. The temperatures lower during the night, and hover around 7°C and the lowest at 5°C. The weather is Paris can be unpredictable so you need to be ready for summer and rains. The best way to go about this is to use layers, take a thin windcheater, trench coat or raincoat and umbrella for those spells of rain. Also, carry waterproof shoes and comfortable flats, for all the walking you will do. You can bring on summer clothes, but do carry along an evening dress/suit for those Seine Dinners or Cabaret Nights. Paris has one of the most efficient public transport systems in Europe. The RATP is the state transport that runs the network of Metro (Underground), RER Suburban Train, Bus and the Night Bus. The RATP issues tickets and passes that are a convenient way to travel across all these options, through the six zones of the city. Vichyssoise is a delightful chilled soup that is perfect for a warm summer’s day. The soup is made of potatoes, leek, onions, cream and chicken stock. The thick soup is a traditional French dish served during the summer before a meal. A spring salad is a chef’s dream, especially in Paris in April which sees the best of the year’s fresh produce in the markets. The most popular among them is the Salad Nicoise that originated in Nice. The tossed up salad includes tomatoes, hard-boiled eggs, anchovies, Nicoise olives and lots of olive oil. The puffy air-filled Soufflés are a delicious treat any time of the year. The spinach soufflé uses the goodness of spring spinach and is a tasty summer dish. The savory treat can be eaten as an appetizer or simply to snack in between the long sightseeing summer days. Galettes are crusty cakes filled with a variety of sweet and savory items and baked to golden perfection. They are akin to pies and are a spring delight. The Blueberry Galette is a must-have Parisian treat that is full of the seasonal fresh blueberries. 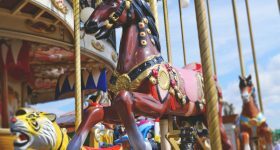 The Foire de Paris starts from April 27th till May 8th and is a classy version of the Foire du Trône. Running since 1904 it features household goods and hosts more than 3,500 exhibitors. The Color Run is an exciting 5KM run inspired by the Indian festival Holi. Participants throw organic colors and enjoy the colorful revelry on the streets of Paris. It is generally held on the 3rd Sunday of April. Centre Pompidou is conducting the Histoire(S) D'une Collection, a temporary exhibition about the collection of the National Museum of Modern Art from April 15th – May 25th. Take a stroll in the many public parks of Paris including Jardin Des Tuileries, Jardin du Luxembourg, Jardin des Plantes, Parc Floral de Paris,and Parc Monceau. The parks have seasonal flowers blooming and are filled with Parisians enjoying sunny days out in the park. Planning to Visit Paris In April?